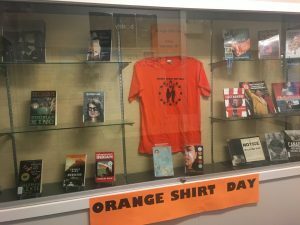 Orange Shirt Day is commemorated on Friday, September 28, 2018 throughout the Burnaby School District, and throughout the Province of B.C. on Sunday, September 30, 2018. The Burnaby School District – together with the Burnaby Teachers Association – will be honouring residential school survivors on these days. We encourage all students to show their support by wearing an orange shirt to school on Friday, September 28, 2018. The Cariboo Hill Library shows our support with this thoughtful display which has been up for the past week. For more information about this important day go to the official Orange Shirt Day website. Professional resources and lesson plans related to Orange Shirt Day can be found here.